In 1869 George Goyder surveys Darwin for the S.A. government and begins the establishment of the city initially called Palmerston. 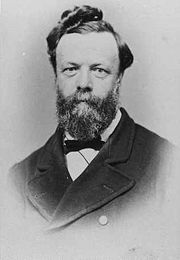 George Woodroffe Goyder (24 June 1826 - 2 November 1898) was a surveyor in South Australia while the Northern Territory was part of South Australia. In 1911 the NT was transferred to the Australian Commonwealth government. Goyder had arrived in Adelaide in 1851 and worked there as a civil service draftsman becoming Assistant Surveyor-General by 1856 and Surveyor-General by 1861. A re-enactment to commemorate the arrival of G.W. Goyder in Darwin on the 5th February 1869 is held by the National Trust each year near the Deckchair Cinema. 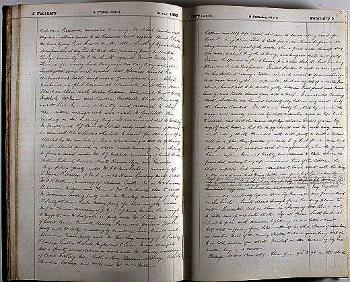 Goyder recorded the experience of landing to establish the new town in his diary at the time. The first well sunk for fresh water described below is still visible in the area now known as Doctors Gully. It is surrounded by a Darwin City rainforest and well worth a visit if you come to Darwin. Captain and self left vessel at 5 am to sound along coast for best landing place, and to look for water. Found surface water along coast oozing out of the rocks, also a fresh water swamp about 2 1/2 miles distant E. of point Emery, and surface water in a gully between Fort Point and Point Emery - found also that the best landing place was close to Fort Point. Landed parties to work as arranged on the previous evening. Captain removed vessel from anchorage to as near landing place as possible, about an eighth of a mile from shore - Caused well to be sunk in gully between Fort Point and point Emery, and tracks cleared from well to beach. Commenced landing stock - bullocks all landed successfully but one very weak - half the horses landed, black mare badly handled by men in the dingy, and nearly drowned, went in life-boat to assist, and took the mare safely ashore - Orders given by myself and Captain that the dingy should not be used any more in landing stock - Proceeded with well-party to sink a second well in a flat, three-quarters of a mile E. of Fort Point - Men sank four feet through nodulous earth to conglomerate, when the ground became softer. Examined locality and returned to ship, where we found that, contrary to my express orders and those of the Captain, the ship's carpenter had again attempted to land stock with the dingy and the result was that 'Young Bobby', one of our best horses was drowned. But for the willingness and energy displayed by the carpenter in landing stock, I should have considered this loss solely attributable to him. My English terrier dog, carelessly left on shore by Homeyer, was found dead on the beach. Track cleared through from landing places to well. Teamsters sent on shore in charge of Wm Rowe sent to take care of and water stock. Squall from South-East at about 2 pm with thunder, lightening, and a little rain. Self still suffering from bilious attack - no other illness of importance on board. Most of the country thickly timbered, grass long and of but little service for stock. Visited in the evening by two native boys in a canoe. Breeze N.W. - Bar: 29.9 Ther: from 92° to 96° in the shade." 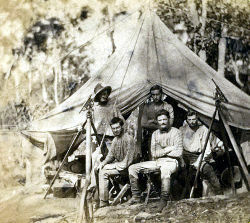 Return from Goyder surveys Darwin to Enjoy Darwin Home.